The 3rd generation Nest Learning Thermostat is slimmer, sleeker and even more beautiful. With a bigger, sharper display and Far sight, you can see the time or the temperature you’ve set from across the room. And now it even controls your hot water tank. The Nest Thermostat learns the temperature you like, then programs itself. It uses built-in sensors to confirm no one’s home and It knows how long it takes to heat your home so you’re comfortable when you get there. When you leave, it turns itself down so you save energy. And you can check your Energy History with the Nest App to see how much you’ve saved. 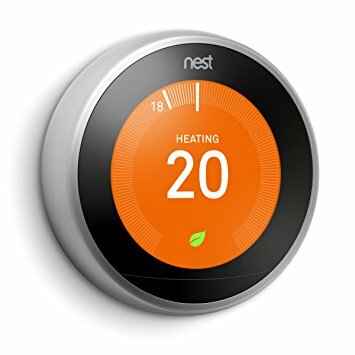 The design of this generation’s Nest Learning Thermostat is great – it’s unobtrusive and easy to use, making programming your heating simple and straightforward. You don’t have to think about saving energy and the temperature is always comfortable. This is such a simple and convenient way to save energy. A nice feature is that it learns from your preferred settings and keeps you in the perfect temperature. Four out of five stars, IMHO. Every time it needs an upgrade you have to re input all of your data – very annoying. Otherwise it’s simple to use and nicely thought-out. I bought it after seeing it at a friend’s house. Works just as advertised. I had a few very minor problems, but when I called customer service they fixed it right away. The Nest Learning Thermostat is genius and automatically thermostat learns exactly which temperature you prefer when you are home. If I leave the house, the thermostat automatically recognizes my absence and adapt the temperature. We save so much energy now and I feel that this was one of the best purchases I made this year. We collect so much valuable data with which we can analyze our energy consumption. On top of that, it has an outstanding design. The display is rather small and some options are not displayed at the same time. Nowadays there are a lot of smart thermostats out there, but I was really surprised just how much you can get out of the Nest Thermostat. Its main feature is its learning design to save you the most money. After a few days of changing the temperature, the Nest Thermostat will ask if you want to activate “Auto-Away.” If enabled, this option will save the most energy and lower the bill. It follows your schedule and automatically changes the temperature based on what you like and if you’re home. It should be noted though; the Nest has no individual room sensors. So like a traditional thermostat, it will only change the temperature based from the room it’s in. For installing, Nest has made the process as simple as possible. Before buying the product you can check to see their compatibility screen which is very user friendly. Nest offers a lot of documentation and just searching “Nest Learning Thermostat 3rd Generation” on YouTube provided me with tons of videos on how to install it. If there are any problems, Nest has a support number that will work with you fantastically. Nest also offers a phone app with the product. It includes a lot of options for the thermostat and the home itself. There are settings for cooling/heating, humidity control, fans, away-mode, changing your schedule, viewing how much energy you saved, support, and a bunch of other stuff that provides a lot of information and tools. The app will also send an alert if the house is getting too hot or too cold, and even when to replace the air filter. The thermostat did have some issues at the beginning, such as not displaying the current temperature. Good news is Nest has fixed this problem after listening to feedback and they’re still updating the product completely free. With those updates the Nest Learning Thermostat 3rd Generation really starts to live up to its name, providing the most out of any nest thermostat, like their “Far-Sight” feature, or outside weather display. Overall I really like the product; it saves a lot of energy and money for the cost, and offers so much in a small device. Installation was SO EASY. There are loads of Youtube videos and other instructions you can find online if you have any trouble. And from there, after installation, there’s pretty much nothing you’ll have to do with it ever again! It learns your preferences, and is the epitome of convenience. I’ve had a few other smart thermostats before this one, and this one definitely takes the cake. Great design, analytics, and app.